We are in Key West right? After some wicked weather over the weekend and three canceled trips, we had a strong cold front pass over the Keys. The same clipper that brought cold and snow up north this weekend brought us a cool night last night at just under 70 degrees and a good north breeze. Tonight is forecast to be colder at 66 degrees and probably a record low temperature. This probably doesn't sound so bad to those up north, but we are normally at about 75-85 degrees (night-day). The water temps have dropped to the low 70's after being around 80 degrees last week and should drop a few more tonight. 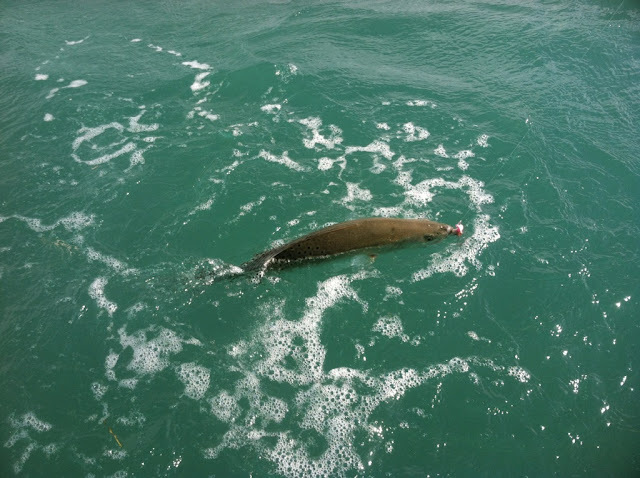 This really puts a damper on tarpon fishing which should banner right now. 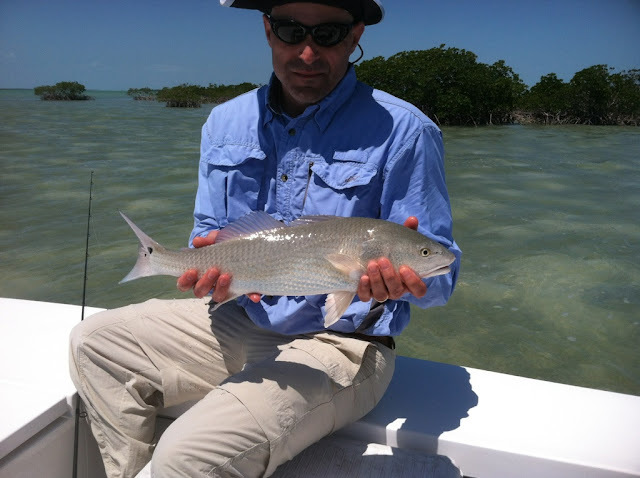 Instead of struggling all day to find tarpon and those we might probably won't eat, we decided to have a fun fishing day and fish the backcountry basins for trout, ladyfish and jacks. I chummed some for sharks, but none showed up. Chris, my angler this morning, caught this big trout (Key West standards), several ladyfish and jacks. I took Chris to the redfish flat that was good to me most of this winter and we found several mudding and cruising. We spent the last hour and a half on the ocean side in hopes of permit or tarpon. Though we didn't see any permit we did see about six tarpon, which was quite surprising to me given the 72 degree water temp. They were hugging the bottom, moving fast and incredibly difficult to see despite the perfect blue sky we had. Another cold night tonight, then hopefully back to normal in a couple of days. It has been a very difficult season so far, I hope things get straight here soon. Here we are at the end of April and I will be wearing my fleece in morning.